With baseball season approaching, we thought we'd warm everyone up for our favorite time of year by talking about...the closer. For those who don't know, the closer is someone who specializes in sealing the deal. See, in baseball you play until the game is over. Not the case in other sports. Take basketball for instance. There's a minute left, you're up five points and rather than drive to the basket, you run out the clock. In football, you take a knee. Soccer, hockey -- you name it. Most major sports have a way to play it safe. I think we all have the tendency to play it safe on occasion. As Christians, we can get into a mindset of "I'm saved, I can coast, I think I'll run out the clock today." But days can turn into weeks and weeks, years. Which reminds me, in baseball, there is no clock. You don't know how long a life -- I mean -- a game can last. Thus, the need for a closer. Someone who takes the hill and does his best work at the end. We lost a closer yesterday. A hero of the faith. Although he would never refer to himself as such. But if anyone loved Jesus, it was Billy Graham. And if anyone wanted you and me to know Jesus, it was Billy Graham. "End your journey well," he said. 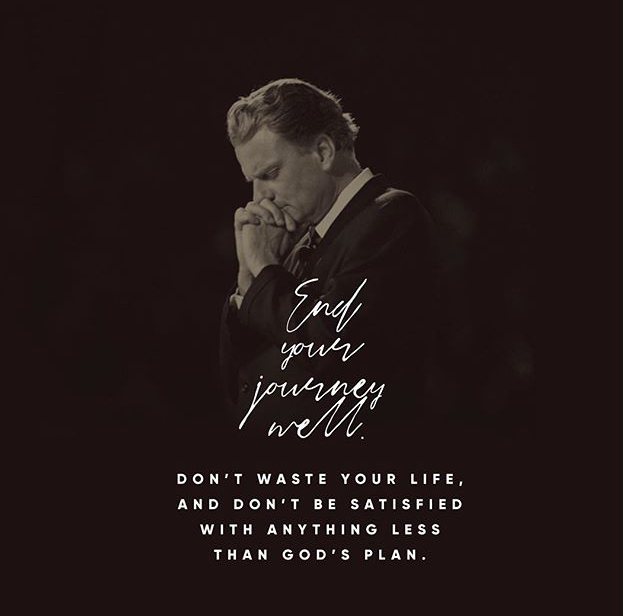 "Don’t waste your life, and don’t be satisfied with anything less than God’s plan." Thank you, Billy Graham. You took the hill your entire life to talk about Jesus. And now you're with Him. What a way to close.